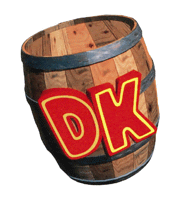 Official artwork of a DK Barrel from Donkey Kong Country Returns. 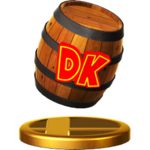 The DK Barrel (DKバレル, DK Barrel) is an item from the Donkey Kong universe. 1 In Super Smash Bros.
Donkey Kong bursts out of a DK Barrel as his on-screen appearance. A DK Barrel appears as a sticker. Donkey Kong and Diddy Kong both appear out of DK Barrels as their on-screen appearance. 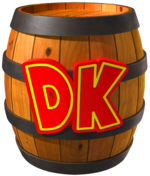 Trophy of a DK Barrel in Super Smash Bros. for Wii U.
Donkey Kong and Diddy Kong's on-screen appearances once again feature them breaking out of these barrels. DK Barrels appear in SSB4 in two main roles. The DK Barrel trophy appears in both versions. Little known fact: the "DK" on a DK Barrel stands for "Donkey Kong"... What? You mean you already knew that? In that case, you must also know that hopeful feeling you get upon seeing one of these in a really tough stage. Break one to release a helpful partner! Did you know that the "DK" on a DK Barrel stands for "Donkey Kong"?... You did? Well then, maybe you also know what a beautiful and hopeful feeling it is to see one of these when you're toughing it out alone, all sad and forlorn. Break it and a partner will show up to lift you out of you doldrums and help you on your way. In Smash Tour, DK Barrel is a red item. A player can use a DK Barrel at the beginning of a battle to have another one of their acquired characters join them in the battle as a CPU ally. DK Barrels appear in every game of the Donkey Kong Country series. In the first DKC game, breaking a DK Barrel would allow Donkey Kong or Diddy Kong to regain the other Kong as a partner. Later games would have other Kongs that could be retrieved from DK Barrels to serve as partners, including Dixie Kong, Kiddy Kong, and Cranky Kong. DK Barrel trophy in Super Smash Bros. for Nintendo 3DS. Donkey Kong appearing from a DK Barrel in Smash 64. Donkey Kong appearing from a DK Barrel in Brawl. Diddy Kong appearing from a DK Barrel in Brawl. Donkey Kong appearing from a DK Barrel in Smash 4. Diddy Kong appearing from a DK Barrel in Smash 4. This page was last edited on November 8, 2018, at 17:38.